On Monday I was in a crazy jamming session. Not the music one but the juicy one! So here I am sharing yet another recipe. This one is for blackberry chocolate jam. 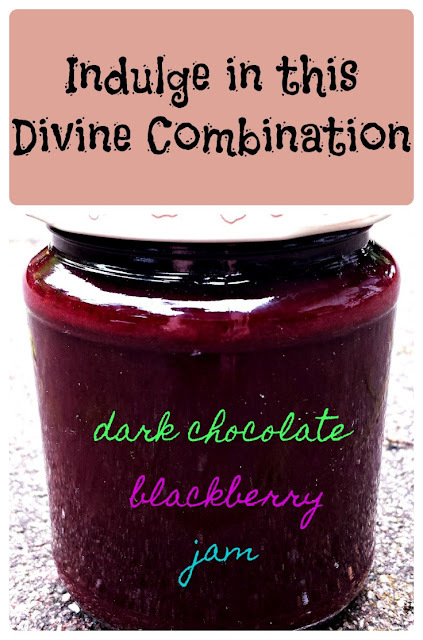 I have never tried to mix chocolate with jam before. This was a first and I really like the outcome. 250 grams of gelling sugar (in the US jelly sugar). Using gelling sugar will allow you to use only half the amount of sugar. Bring Blackberries and gelling sugar to a boil, whizz until most of the blackberry seeds are not visible anymore! Take pot off the hot hob and add chocolate in little chunks. Now stir until dissolved! Fill in sterilised jars while still hot and screw lids on tightly. Now turn the jam jars upside-down. Let cool to room temperature while upside-down. Label and voilà your Blackberry Chocolate Jam is ready for use! Preparing your own jam really is no rocket science and well worth the work put into it. Some of the ingredients in bought jam give me goose bumps...like why does it need food colouring? Why would you add 60-70% of sugar? Do you really want to eat jam with corn starch syrup? A detailed how-to for sterilising jars and any jam making or canning basics you can find here. 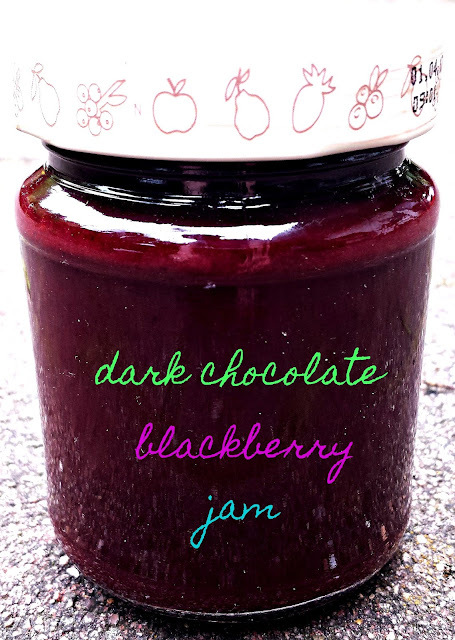 I hope you will enjoy your blackberry chocolate jam. If you combine this one with peanut butter on some sweet bread. You should feel heavenly instantly! I just love the combination of berries and chocolate. This recipe really sounds very yummy! I will definitely try this. Oh please do and let me know how you liked it! It makes me so happy to hear you tried it and loved it! I love hearing back, when someone tried my recipes and loves them! <3 Thank you so much for letting me know! Nefeli, Thank you! I hope your kids (and you!) )will love it as much as we do! Oh wow Pat!! This looks absolutely wonderful.....did you invent this recipe? Thanks, Jinzo! Yes, I did :) The Peppermint Blackberry one, too. I enjoy experimenting with food! Do you need test tasters? I volunteer as a tribute!! You are more than welcome to hop over the pond for a tasting! I´ll have home backed bread there to go with it!